﻿The Society of Nuclear Medicine and Molecular Imaging’s (SNMMI) Cardiovascular Council and the American Society of Nuclear Cardiology (ASNC) have issued the joint position paper, Clinical Quantiﬁcation of Myocardial Blood Flow Using PET, which was jointly published in the Journal of Nuclear Cardiology and The Journal of Nuclear Medicine. Radionuclide myocardial perfusion imaging (MPI) is among the most commonly performed diagnostic tests in cardiology. 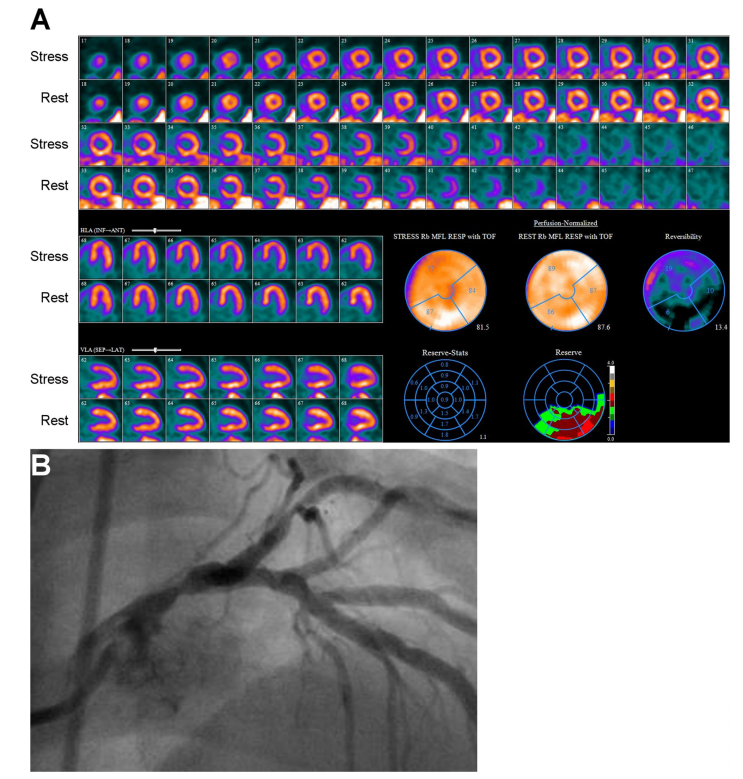 Positron emission tomography (PET) can quantify global and regional myocardial blood flow, assess regional perfusion abnormalities with relative MPI, and assess function abnormalities and chamber dimensions. Quantification of myocardial blood flow requires accurate measurement of the total tracer activity transported by the arterial blood and delivered to the myocardium over time. This position statement consolidates and updates technical considerations for clinical quantification of myocardial blood flow and myocardial flow reserve, and it summarizes and updates the scientific basis for their clinical application. “Quantification of myocardial blood flow is the next great leap in nuclear cardiology, and this document summarizes the data supporting its use and offers guidance to those who are planning to make these measurements in practice,” explains Venkatesh L. Murthy, MD, PhD, vice president-elect of SNMMI’s Cardiovascular Council and a lead author of the position statement. FIGURE: Clinical utility of blood flow quantification. In this example, from an 81-y-old man with hypertension and dyslipidemia, relative MPI (A) with 82Rb PET demonstrated only mild, reversible perfusion abnormality involving distribution of left anterior descending coronary artery. However, MFR was severely reduced globally at 1.11. Nearly entire heart had severely reduced MFR except for inferior and inferolateral walls, where it was only moderately reduced. Coronary angiography (B) showed severe stenosis of mid portion of left main coronary artery. Authors of “Clinical Quantification of Myocardial Blood Flow Using PET: Joint Position Paper of the SNMMI Cardiovascular Council and the ASNC Writing Group” include Venkatesh L. Murthy (cochair) and Edward P. Ficaro, University of Michigan, Ann Arbor, Mich.; Timothy M. Bateman, Mid America Heart Institute, Kansas City, Kan.; Rob S. Beanlands, Robert A. deKemp and Terrence D. Ruddy, University of Ottawa Heart Institute, Ottawa, Ontario, Canada; Daniel S. Berman and Piotr J. Slomka, Cedars-Sinai Medical Center, Los Angeles, Calif.; Salvador Borges-Neto, Duke University School of Medicine, Duke University Health System, Durham, N.C.; Panithaya Chareonthaitawee, Mayo Clinic, Rochester, Minn.; Manuel D. Cerqueira, Cleveland Clinic, Cleveland, Ohio; E. Gordon DePuey, Mt. Sinai St. Luke’s and Mt. Sinai West Hospitals, Icahn School of Medicine at Mt. Sinai, New York, N.Y.; Vasken Dilsizian and Marcelo F. Di Carli (cochair), University of Maryland School of Medicine, Baltimore, Md. ; Sharmila Dorbala, Brigham and Women’s Hospital, Boston, Mass. ; Ernest V. Garcia, Emory University, Atlanta, Ga.; Henry Gewirtz, Massachusetts General Hospital and Harvard Medical School, Boston, Mass. ; Gary V. Heller, Morristown Medical Center, Morristown, N.J.; Howard C. Lewin, Cardiac Imaging Associates, Los Angeles, Calif.; Saurabh Malhotra, Jacobs School of Medicine and Biomedical Sciences, University at Buffalo, Buffalo, N.Y.; April Mann, Hartford Hospital, Hartford, Conn.; Thomas H. Schindler, Johns Hopkins School of Medicine, Baltimore, Md. ; Ronald G. Schwartz, University of Rochester Medical Center, Rochester, N.Y.; and Prem Soman, University of Pittsburgh Medical Center, Pittsburgh, Pa. Please visit the SNMMI Media Center to view the PDF of the joint position statement, including images, and more information about molecular imaging and personalized medicine. To schedule an interview with one of the authors, please contact Laurie Callahan at (703) 652-6773 or lcallahan@snmmi.org. SNMMI’s more than 15,000 members set the standard for molecular imaging and nuclear medicine practice by creating guidelines, sharing information through journals and meetings and leading advocacy on key issues that affect molecular imaging and therapy research and practice. SNMMI’s Cardiovascular Council works to ensure and enhance the quality and clinical utility of the use of cardiovascular nuclear medicine studies in patient care. For more information, visit www.snmmi.org. ASNC is the recognized leader in quality, education, advocacy and standards in cardiovascular imaging, with more than 4,200 members worldwide. 2018 marks its 25th year anniversary as the only society dedicated solely to advocacy issues that impact the field of nuclear cardiology and is working with success to influence regulations to fight onerous private health plan policies – adverting reimbursement declines and fighting for improved payment and coverage. ASNC is dedicated to continuous quality improvement, education and patient-centered imaging, illustrating the ongoing commitment as a leader in the field of nuclear imaging and improving patient outcomes. ASNC establishes standards for excellence in cardiovascular imaging through the development of clinical guidelines, professional education, advocacy and research development. ASNC’s members are comprised of cardiologists, radiologists, physicians, scientists, technologists, imaging specialists and other professionals committed to the science and practice of nuclear cardiology. For more information, visit www.asnc.org.